All children can benefit from (and will likely enjoy) rolling, catching, kicking, dribbling, and tossing a ball—an inexpensive, readily available, and versatile toy. 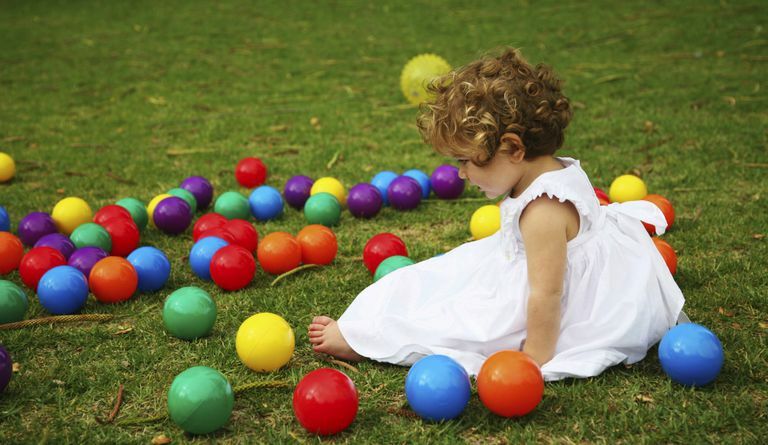 Playing with balls improves kids' motor skills, hand-eye coordination, and timing, which are important parts of the developmental progression of toddlers. The skills children learn by playing with balls will also be important once they graduate to collaborative and competitive play. Balls are must-have toys. You can introduce them to your baby very early on because they immediately strengthen motor skills and familiarize little ones with their environment. Early on, babies gravitate toward things that roll. Your infant will be fascinated by a ball's continuous movement. Balls allow children to feel in control of something other than their own movements. They help build balance skills and allow little ones to practice transferring an object from one hand to the other. Rolling a ball back and forth is a way to build a social bond between two people (you and your baby, or your baby and a sibling or playmate). This turn-taking game is also an introduction to the concept of cause and effect. Toddlers will enjoy discovering a ball's abilities and the different effects of bouncing, rolling, tossing, kicking, and dropping it. A ball will remain an entertaining toy as your child transitions from independent play and parallel play to collaborative play, which is vital in developing social skills, such as learning how to share, how to follow rules, and how to negotiate. You have a wide variety of choices for balls, with variations in size, texture, and firmness. Large balls will take two hands to throw, which is an entirely different skill than throwing a small tennis ball with one hand. Give your toddler the opportunity to practice with both. All balls for babies and toddlers should be large enough that they are not a choking hazard. The best balls for toddlers overall may be Wiffle balls, because they are lightweight and have holes that make them easy for toddlers to handle. They are also less likely to cause injury or damage. For indoor use, you may want to pick Wiffle balls or small, soft balls that are less likely to break anything. Beach balls can also be a fun alternative. Keep large and/or heavy balls outdoors, or use them inside only when you're able to supervise. Set ground rules about throwing balls, indoors or out, and enforce them. You should also set rules about not throwing balls at other people except when they are prepared to catch them. Teach your child that balls should not be used as a weapon and that balls thrown in the house can cause damage. Any games that you play with a ball will also have rules that are appropriate for the age of the child. A toddler may be too young to understand rules other than what is needed for safety, so keep their games simple (and breakable items far away). A large box or basket kept on the floor serves as storage and as a place to throw the balls for a fun game. Wicker baskets, laundry baskets, and plastic containers all work well. Make sure the container isn't deep enough that toddlers could fall in when they are trying to retrieve their toys.